This lovely all in one system from Ruark has been three years in development and is well worth the wait! Ruark made their name by making really high quality loudspeakers with a reputation second to none. Their passion for great looks, great build quality and great sound all gels together in the latest version of the R7. 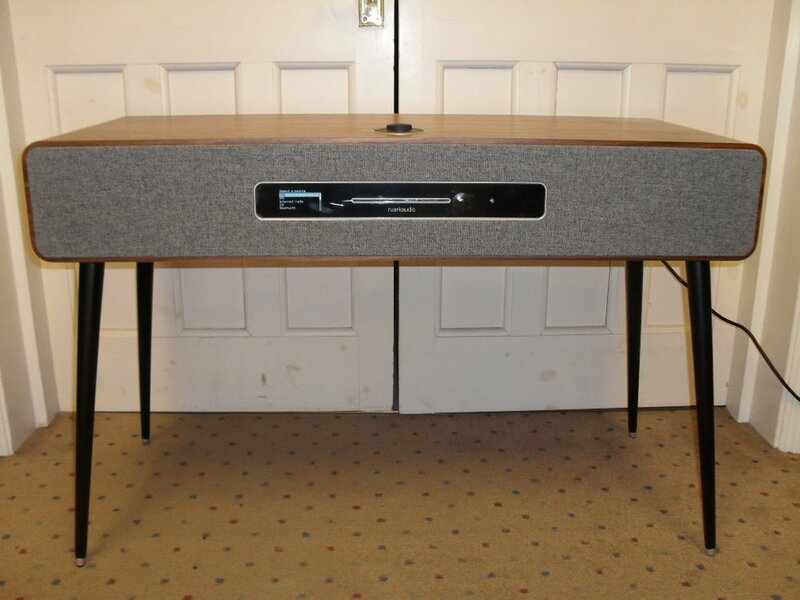 We have always been big fans of the previous incarnations of Ruark's all in one music system and the new model does not disappoint. It has built in CD player, streamer, DAB/DAB+/FM radio, Internet Radio, Bluetooth, Subwoofer, Phono input for vinyl, Headphone socket and sports two 140mm dual concentric drive units. All of this plus USB charge / playback and plenty of analogue and digital inputs too! It is a great pleasure to be able to champion a UK design. The styling is gorgeous giving the new model a more sleek Scandinavian look compared to the older retro 60's and 70's look. Colours available are Walnut with black spindle legs or Soft Grey with pale pine legs. 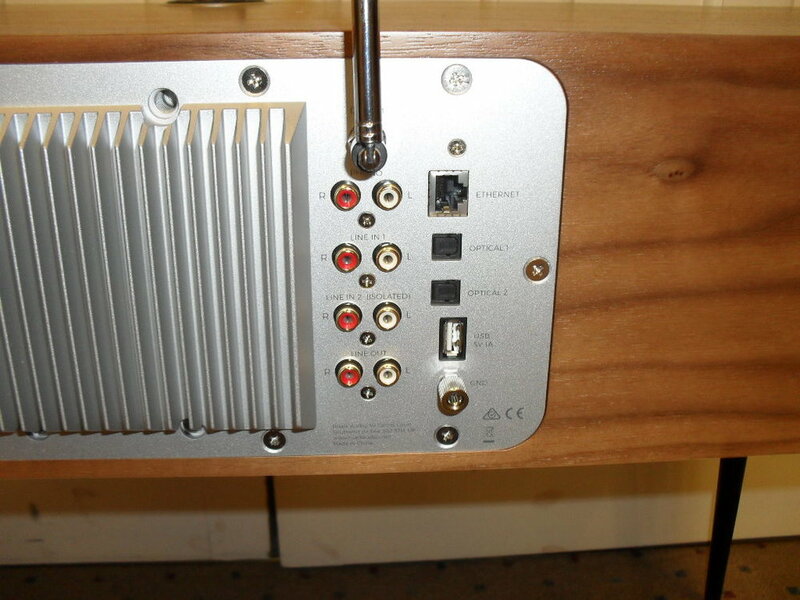 There is also a very clever TV mount available as an optional extra so it can be used as a sound bar! If you wish to you can also multi-room the R7 Mk3 by using the smaller Ruark R2 Mk3 radios enabling you to stream your music to other parts of the house, even vinyl! It helps that Spotify Connect is built in to the R7 Mk3 so if you have a Spotify Premium account you can select the R7 as your playback device and then control music using the R7's Roto Dial remote control. The electronics inside the R7 have been specially designed to eke out the best possible sound for the size and the price. The two front firing speakers give a lush, clean and detailed sound which is all underpinned by the integrated subwoofer which adds scale and weight to the bass performance which makes all types of music more involving and realistic. Proper HiFi sound! There are plenty of spare inputs available to cover all future eventualities and perhaps most important of all in these days of vinyl resurgence there is a phono input too! The Ruark R7 Mk3 comes with the long spindle legs or little puck feet for mounting on an existing sideboard or AV cabinet. Available for demonstration in the Cheltenham store. On Thursday the 5th of October we are holding a Bluesound Hi-Res listening event. Bluesound is a multi-room high resolution streaming system which allows you to add great sound to any room. Bluesound also gives you the ability to add music streaming to an existing Hi-Fi system. And with the Vault 2 ripper and streamer you can rip and store your entire CD collection on to the 2TB (terabyte) hard drive, which equates to approximately 2600 CD's - freeing up space in your home if you have your CD stored in racks or towers. Click on the poster to book your place. Using the Bluesound app you can stream from a number of music services, such as Spotify, Qobuz, TIDAL and of course any music you have stored on computers or servers, from the comfort of your sofa. Now you have the convenience of millions of tracks at your fingertips. On the day we'll be recreating the ear opening demonstration that was conducted the Bristol Hi-Fi show earlier this yearA representative from Bluesound will allow you to listen and hear the difference in sound quality between MP3, CD and MQA from the TIDAL Masters collection. This will be a great opportunity to introduce yourself to the Bluesound range of streaming products, or if you are already acquainted, it will be an excellent chance to ask any questions you may have. In the meantime if you have any questions please do not hesitate to contact us or pop in. Click here to reserve your place or drop in on the day between 12-7 pm. We look forward to seeing on Thursday 5th October. So to start with the Sonos Playbar has been designed to either sit in front of your TV or to be wall mounted whilst the Playbase sits underneath your TV. You will need a rack or TV stand 72cm wide & 38cm deep to fit this BEAST. The Playbar's is 90cm wide (which is very close to the width of a 40" TV to look uniform) and 14cm deep to house comfortably. The Playbase features newer style controls as seen on Play:5 Gen2. Touch control volume -, + and Play/Pause/Skip Track can be found in picture 1. The Connect button is shown in picture 2. Whilst the Sonos Playbar in picture 3 uses buttons towards one side, allowing for the same level of control as the Playbase. The connections are still very similar between the 2 products. Uncomplicated and straight forward. You can find power, ethernet in (or out, to feed other devices with an Internet connection.) and optical in (to take the sound directly for your TV or Sky/Virgin box). So what do they sound like...? We love our job and we are fortunate to have comfortable demonstration rooms, which we can use to evaluate Hi-Fi products and so that our customers can hear the product for themselves so they can make an informed choice when buying. After our comparative listening session we found that both are not surpisingly excellent performers. The Sonos Playbar gives a wider more detailed sound presentation whilst the Sonos Playbase has better depth of bass, However this is just our opinion, what matters most is yours, so why not come and listen and find out for yourself. Summer is coming and we've some new products to tempt you. We've waited the best part of 20 years for a new speaker cable and the wait is finally over! What's more they've added new top-of-the-range interconnects too. The reaction of Naim's forum is nothing short of spectacular so why not either arrange for a demo or better still try them at home. Ours are now fully run in and raring to go. Naim's latest addition to their extraordinary line up of streaming products in the new NAC-N272 Pre-amp streamer which, with the addition of one of their power amplifiers gives you a highly sophisticated high-end solution in just two boxes. Needless to say there are upgrade options with the addition of external power supplies too so you're still future prove. Available with or without FM/DAB radio. Recently we were asked to demonstrate these two Yamaha products and so taken were we with their performance we just had to stock them. Beautifully built as you'd expect for a top-line Yamaha, they have a gorgeous rich yet detailed sound quite reminiscent of a valve amp but with oodles of power. The SACD/CD player features digital in so can also be used as a DAC for other digital devices. Full tone controls and a pair or retro VU meters complete the classic look. The Sonos Playbar has arrived! The set up could not be easier, from getting it unpacked it was up and running in about 5 minutes!. We have set it up with the Sonos Sub which again was a dream to set up. As well as connecting to the TV to massively improve the sound quality compared to the TV's own speakers, it (as you would guess) also features all of the usual Sonos music playback capability. To switch form listening to the TV to use it as a music player is simply one selection from the home menu - it could not be any easier!. So you can get an idea of it's size and shape the pictures show it underneath a 55" screen..
High Definition televisions offer an amazing picture but often lack the powerful, realistic sound that movie, music and game enthusiasts enjoy. The new SONOS PLAYBAR delivers sophisticated home cinema acoustics and wirelessly streams all the music on earth. And it all comes from one easy-to-use player that brings HiFi sound to HDTVs. The 9-speaker design of the SONOS PLAYBAR wireless soundbar delivers room filling home theatre sound for your TV and wirelessly streams all the music on earth through one easy-to-use soundbar. Flood any room with epic, full-theatre HiFi sound. The PLAYBAR adjusts automatically to the differences between shoot ‘em up action flicks, Shakespearean dramas, and live concerts to deliver the sound as it was intended. Enjoy a universe of music in every room - your iTunes library, music services like Spotify and Napster, and more than 100,000 free Internet radio stations, podcasts and shows. PLAYBAR connects to your TV using a single optical cable and plays everything that’s connected to the TV, including satellite boxes and game consoles. Control PLAYBAR volume and mute using your existing TV, satellite or universal remote. And for streaming music you can download the free Sonos Controller Apps for your smartphone, tablet or computer. Expand your Sonos system throughout the entire house, and play your music wirelessly in other rooms. Just add another Sonos player wherever you need music, for the ultimate music system. The PLAYBAR will begin shipping on March 5, 2013, but you can pre-order your's now by visiting one of our stores or by clicking here. ...well, not literally but you get the picture. Just wanted to remind all you good folks out there that require any new Chord Epic speaker cable, we terminate Chord speaker cable instore. Of course we will need a little time to do this, especially if we are busy, so if you don't mind leaving it with us, we can get it terminated for you.